The title of this unusual book comes from the writings of Timothy Leary, the high priest of the psychedelic revolution. A fuller description of the books contents can be found in the books sub title, an investigation of the psychedelic revolution. Some months ago, the authors set out to take a close and objective, but not unfriendly look at the psychedelic phenomenon which, it was now obvious was not a passing fad but had entrenched itself in our society and was exerting a strong influence on its manners, morals, art, literature and religion. While they were planning their book, they had a unique opportunity to meet and interview many of the leaders of the psychedelic debate. They met also with representatives from law-enforcement agencies, from medicine, from the legal profession, and from the world of psychiatry and they recorded on tape and film the words and opinions of the principal proponents and opponents of the world of psychedelia. Out of this material, they have produced a fascinating book. In informal but incisive style they give a history of hallucinogenic drugs and their use throughout the centuries. They discuss other means of mind-expanding from candlelight and incense to the Buddhist mandala; they give the history of the Lysergic acid drugs, their first popularity and the spread of the use of psychedelics. They tell, in the words of the user, what a good trip is like and what a bad trip is like. They list the leaders of the psychedelic movement and give a glossary of its most common terms. They quote Alpert as to its aims, and Leary on the religious movement he has founded on the use of hallucinogenic drugs. Other chapters deal with the influence of psychedelics on religion, art, literature, music, and fashion; with the legal status of the drugs; with its beneficial use in medicine and particularly, psychiatry. The authors quote from the writings of people for and against the movement. While they take no sides, they make every effort to give a fair, clear picture of this unusual phenomenon and its effects on our modern society. 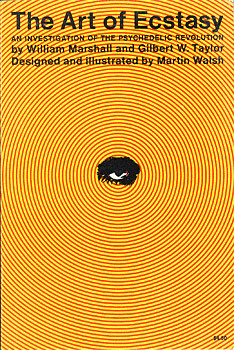 Two of the chapters are entirely graphic; in these the authors have used modern photographic an design techniques to reflect the influence of psychedelic drugs on our modern society.